Some of the star's fans had been disappointed that the weekend service in the late singer's hometown was going to be a private affair and that no public memorial was planned. But Whitney's publicist, Kristen Foster, said The Associated Press would be allowed a camera at Saturday's ceremony in Newark, New Jersey. The service will be at New Hope Baptist Church, where she sang as a child. Her eulogy will be given by gospel singer Marvin Winans, a Grammy Award winner and longtime family friend. 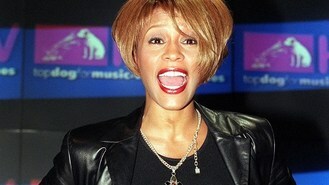 Whitney will be buried in Fair View Cemetery in Westfield, where her father John was laid to rest in 2003. Some fans have already gathered and placed flowers outside the church where the funeral will be held by invitation-only at the request of the star's family, who wish to maintain some privacy. Others have stopped by the funeral home. Meanwhile, Whitney is expected to storm back into the UK charts this weekend with around 27 individual tracks due to head back into the top 200 singles. And one of the two affected albums - Greatest Hits - has seen such a spike in sales that it is in line to go to number six when the charts are announced on Sunday. AP will stream the service on http://livestream.com/aplive.